Owning a home is something that most adults dream about. Especially for the younger crowd that has sacrificed a few years by attending college and pursuing a degree that will offer an illustrious career for years to come. However, many young people do not want to wait 5+ years after college to save up for a down payment on a home. Thankfully, FHA and Freddie Mac offer a way for a parent or other relative to co-sign with someone to purchase a home without the need to live within the property. It is called the non-occupying co-borrower. 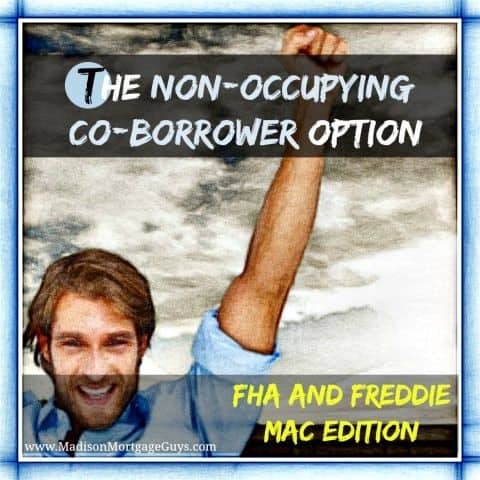 FHA will allow the non-occupying borrower to be either a relative or a close friend. However, it is highly recommended that the borrower is a relative. 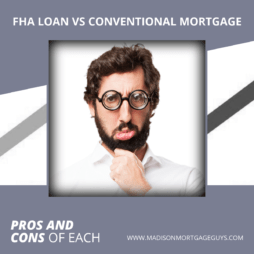 If there is no direct blood relationship then FHA may require an extensive explanation of the relationship between the buyer and the co-borrower. The person may be a citizen or a non-permanent alien so long as the main borrower is a citizen and the primary resident. Along with the basic requirements the following conditions and terms will apply for anyone that is a non-occupying co-borrower. Although the non-occupying co-borrower does not live in the home the person is liable for the mortgage equally with the main borrower. The non-occupying co-borrower must have a main residence within the United States. The maximum loan-to-value ratio of 96.5%, for a 3.5%* down payment, is allowed if the co-borrower is related to the buyer. 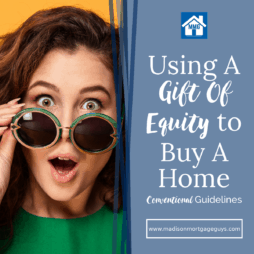 Since many FHA buyers are able to obtain a gift of a down payment from their parents or relatives, the non-occupying co-borrower can skip the usual paperwork associated with the gift and simply use their funds for the down payment. The general rules for a Freddie Mac loan are quite similar to the rules for the FHA loan. If a borrower and non-occupying co-borrower are approved for the mortgage the online underwriting system will determine what debt ratios are allowed for their particular loan. Why use a Non-Occupying Co-Borrower? Some people may wonder why a person would ask a parent or other relative to sign as a non-occupying co-borrower in the first place. After all, it gives the co-borrower more influence over the borrower’s financial life. Primarily, it is done to allow people to buy a home while their future income catches up with their financial obligations. Many people who graduate from college have existed for years on a frugal lifestyle while paying a significant amount in rent and utilities. With the new career and improved income it should not take too long to pay off some of the smaller debt and allow them to free up income to pay towards the home. In addition, many young people fresh out of college have some student loan debt that is suddenly active and requires monthly payment. This monthly payment can cause some borrowers to be just out of reach of qualifying for a mortgage loan. While it is true that several professions and career paths will allow new workers to enjoy healthy increases to their salary each year, mortgage guidelines do not use those likely increases to qualify for a loan. Only the current income of the borrower is used to meet the guidelines for mortgages. Another reason why people ask for a relative to help as a co-borrower is to help overcome slight credit deficiencies. With the changes in mortgage lending rules, a lot of people have a decent credit score and other qualifying factors that will allow them to buy an automobile or get a credit card. In fact, they may even have a strong income and enough saved up for a modest down payment on a home. However, the credit scores are not quite good enough to get a mortgage on their own. A non-occupying co-borrower that has a solid credit history, low debt and enough income to meet their needs as well as help one of their relatives can step in and boost an overall mortgage application. This allows the younger relative to buy a home now, while rates are so low and literally save thousands upon thousands of dollars in interest compared to where the rates may rise to in the next few years. There are a couple of typical situations that are perfect for a non-occupying co-borrower. As mentioned earlier, a young couple fresh out of college with stable jobs and potential increase in salary is a good example. Another example is a young person attending college away from their hometown. Parents may co-sign on the purchase of a home or condo. If the property is large enough it is possible to rent out one or two rooms to other students to help offset some of the mortgage costs. Once the child has finished college the child and parents have an asset that can be sold or rented out for income. 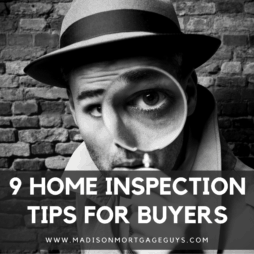 Finally, a theme that is becoming more common is the need for senior citizens to buy a home closer to their children and is in need of the child’s income in order to qualify for a mortgage. This is usually a result of the senior citizen in need of more medical care or attention and needs to be close to family that can watch over them. For the right family, the non-occupying co-borrower rule can be a great way to meet an immediate housing need without the uncomfortable situation of one relative borrowing money from another. Contact us below or apply online to see if you qualify for the FHA or Freddie Mac Non-Occupying Co-Borrower option in Wisconsin, Illinois, Minnesota or Florida!